GOES-R IFR Probability fields, above, expand southwestward across the upper midwest as ceilings lower and visibilities reduce. The fields offered quick guidance on where the lowest ceilings were occurring and how the field of low clouds was evolving. 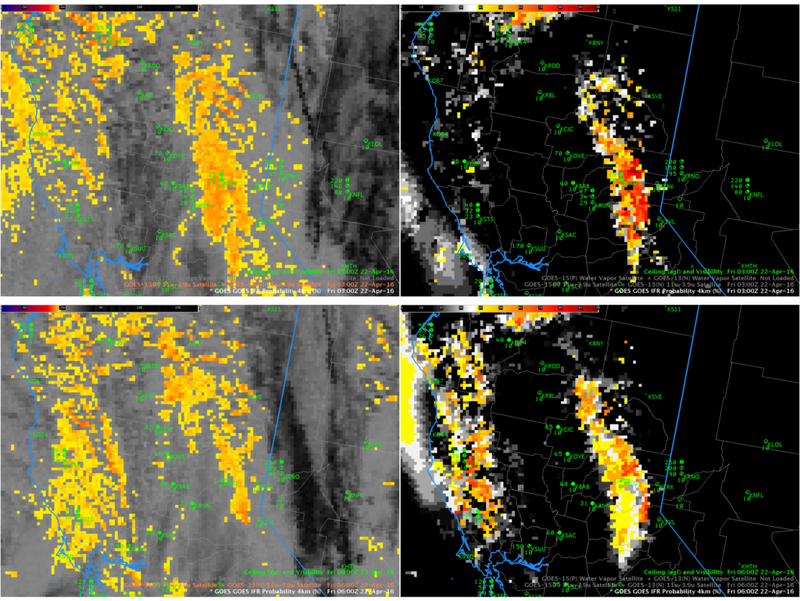 After sunrise (1215 and 1315 UTC imagery), IFR Probability values increased but continued to show a coherent signal over the region of lowest ceilings and smallest visibility. The Brightness Temperature Difference fields for the same times, below, have structures that have echoes in the IFR Probability fields. The depiction of low ceilings and visibilities associated with the largest brightness temperature difference values (the deepest orange-red in the enhancement) is lost, however, as reflected 3.9 µm radiation alters the brightness temperature difference field. By 1315 UTC, the end of the animation, only the IFR Probability field is giving useful information about the low ceilings and reduced visibilities. This entry was posted in Midwest, Wisconsin on April 26, 2016 by Scott Lindstrom. The 1315 UTC image of GOES-R IFR Probabilities, above, shows an axis of higher probabilities aligned with the topography of the Sierra Nevada. Note that Blue Canyon (KBLU) is the sole station reporting IFR Conditions. Did conventional satellite data capture this event? 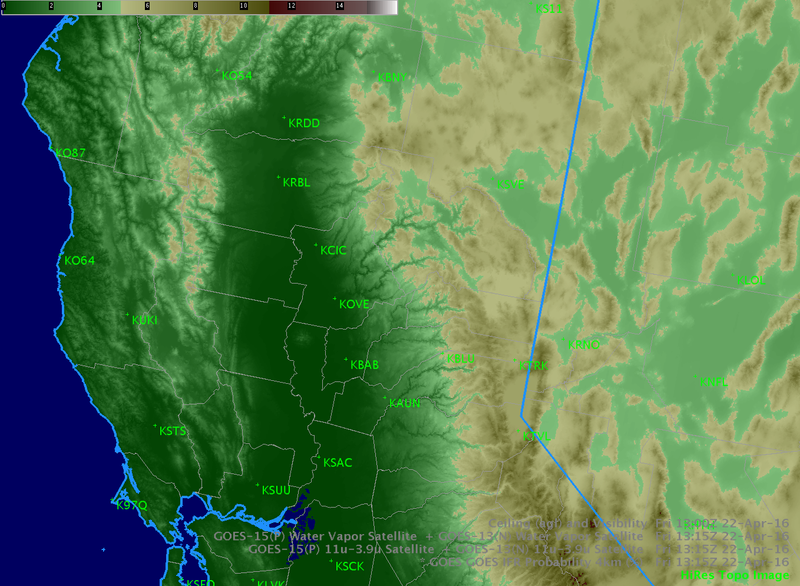 The Water Vapor (6.5µm) and Brightness Temperature Difference fields (10.7µm – 3.9µm), below, do not show evidence of low clouds; indeed, the cirrus signature in the water vapor must mask any satellite observation of low clouds banked along the Sierra Nevada. Thus a fused product that combines model data and satellite data (such as IFR Probability fields) must be used, and the relatively flat nature of the IFR Probability field above confirms that Rapid Refresh information on low-level saturation is the reason why IFR Probability values are elevated along the mountains. IFR Probability Fields earlier in the night did have a satellite component to them. The values at 0300 and 0600, below, show the gradual encroachment of cirrus from the south and west over the low clouds along the Sierra Nevada. 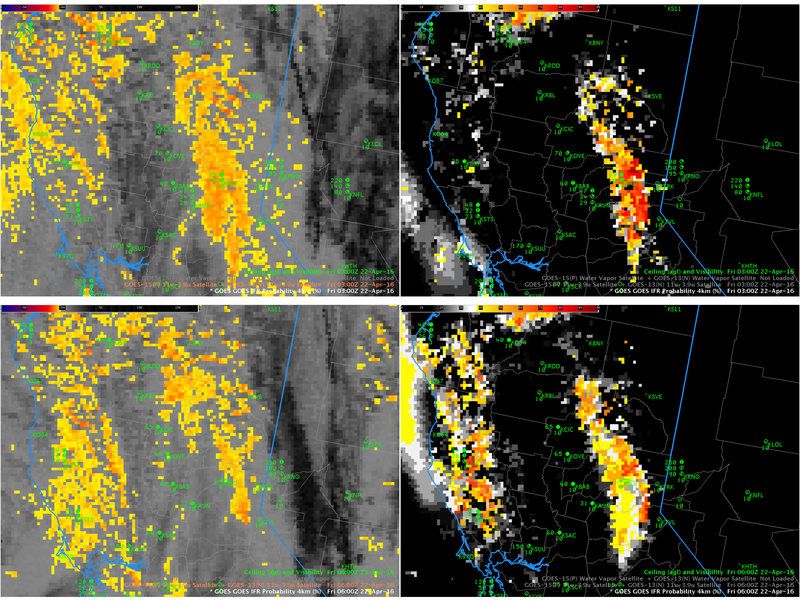 After 0600 UTC, only model data were used over the Sierra as high-level cirrus blocked the satellite view. This entry was posted in California, Multiple Cloud Layers, Terrain on April 22, 2016 by Scott Lindstrom. The image above shows GOES-R IFR Probabilities over North/South Dakota and Minnesota shortly before sunrise on Monday April 18 2016. There is a distinct difference in the field between western Minnesota and eastern North and South Dakota that occurs because Rapid Refresh model fields (low-level saturation) are used as a predictor of IFR Probability. 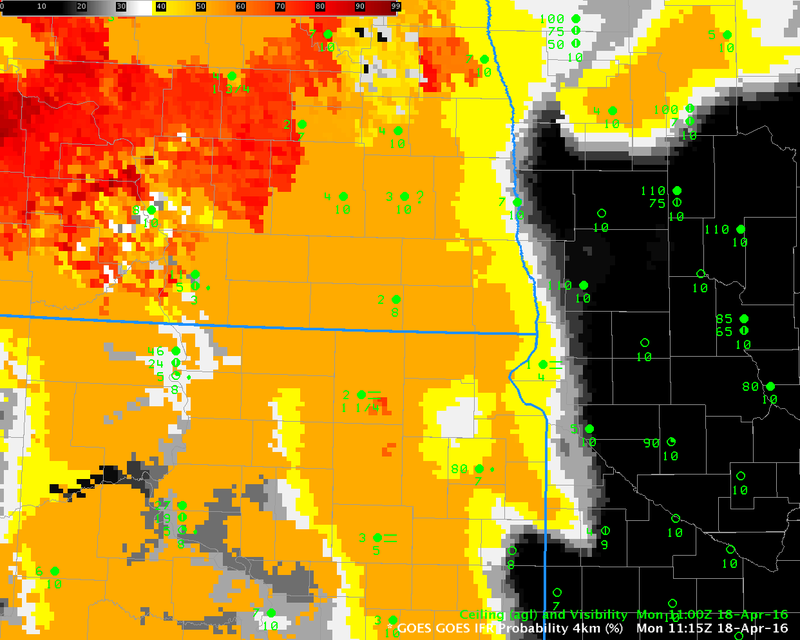 Reduced visibilities and ceilings are reported where IFR Probabilities exceed 50% (the orange shading). In contrast, the window channel and water vapor imagery for the same time, below, gives little indication that fog and low ceilings are present over eastern North and South Dakota: satellite views of the lowest levels are blocked by mid- and upper-level clouds. Fusing model data and satellite data into one predictor yields a superior product for detection of low ceilings and reduced visibilities. This entry was posted in Multiple Cloud Layers, Plains on April 18, 2016 by Scott Lindstrom. Fog developed along the Gulf Coast of western Louisiana overnight. Brightness temperature difference fields have been used in the past to diagnose the development of fog. This capability exists because water-based clouds, such as stratus, have different emissivity properties at 3.9 µm and 10.7 µm. A water-based clouds does not emit 3.9 µm radiation as a blackbody (but it does emit 10.7 µm radiation as a blackbody). Consequently, the computed temperature of the cloud based on the detected 3.9 radiation is cooler than the temperature computed based on the detected 10.7 radiation. The animation above shows the evolution of the brightness temperature difference field, and the field is characterized by a lot of scattershot signal. 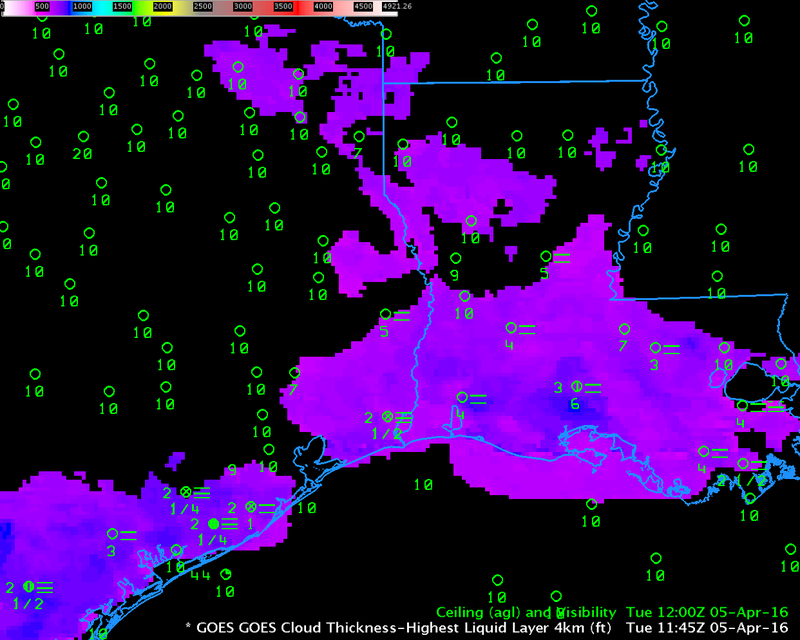 Some river valley can be inferred in the signal, but the region of fog over southwestern Louisiana does not stand out. In contrast, the GOES-R IFR Probability field, below, diagnoses an initially isolated region of enhanced IFR probabilities near stations that are reporting reduced ceilings/visibilities. The enhanced IFR Probabilities develop over southwestern Louisiana and expand outward from there (a second region develops south of Houston TX). Regions where IFR conditions do not develop have very low IFR Probabilities that persist with time. GOES-R Cloud Thickness relates 3.9 µm emissivity to cloud thickness based on historical relationships between that value and sodar observations off the west coast of the USA. The value is not computed during twilight conditions on either side of sunrise and sunset, but the last observation taken before sunrise, shown below, is related to dissipation time according to this scatterplot. Cloud Thickness on the morning of 5 April 2016 was at most 830 feet, suggesting rapid dissipation after sunrise. This is what occurred. This entry was posted in Deep South, Dissipation Time on April 5, 2016 by Scott Lindstrom.